US president Barack Obama’s feeling hot-hot-hot. Quite literally, for reports confirm that he has upped the thermostat setting in his White House office and has been indulging in some Hawaiian temperature comforts. This charismatic Afro-American President has done away with his suit on Fridays and attends office in a cool shirt-and-tie look. Personal designers for Obama’s US elections, Elisabetta Canali, Global communication director said, “Obama chose a ‘made-to-measure’ outfit in blue shade, a colour synonymous with refinement and indisputable elegance.” So impactful is Obama’s sense of fashion that Donatella Versace has dedicated her entire Spring Summer’09 collection to Obama. To give him a style twist, we asked our fashion designers across India that if given a chance how would they dress up the US president and the First Lady, Michelle Obama. Shantanu and Nikhil (Delhi): Barack should be in cutting-edge Jodhpuri jackets worn with a shirt inside. The buttons should be India inspired to add a more global outlook to his outfit. As he is fit: bespoke fitted jacket with low waisted fitted straight leg trousers with a navy blue shirt inside. For an informal look, he can sport fitted ice blue shirt with dark blue jeans and a navy blue thin tie. Overall, he has a personality that can carry off both a formal and informal look and he can also carry off almost any silhouette. Ashish Soni (Delhi): For this weather, I would give Obama washed khakis – the chino variety and a full sleeve golf T-shirt, probably in bubblegum colours. To complete the look, I would give him a nice outer wear jacket – one that is stylised and well-fitted. A pair of loafers, instead of his regular lace tie-up shoes would complete the look. Azeem Khan (Mumbai): I would dress him in a linen golf or polo shirt in vibrant colours teamed with a pair of neat khakis and topped with a smart pair of well-waxed loafers. I would maybe also try and add a two-button sports jacket to complete the look. Manoviraj Khosla (Bangalore): Obama should sport this deep maroon bundgala jacket. His personality requires him to flaunt a look that’s not over-the-top formal, yet funky. Hence, this silk and linen fabric which is specially woven with suede applique work, (in the pic) in this bright yet subtle colour would suit him well. This is a colourfully sober combination and will do justice to the design and the wearer quite brilliantly. Leena Tipnis (Mumbai): I want to influence the world with everything that’s Indian yet with a global sensibility. Hence, I would give Obama a complete Indian look. For a formal look, I would give him a bundgala with subtle, toned, monochromatic embroidery. For informal wear it would be a linen kurta and a fitted churidaar which is more like a fitted trouser. 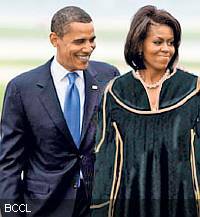 Designer Ritu Kumar (Delhi): To complete the picture of the First couple, I would give Michelle Obama a very contemporary modern look with jackets and dresses. However, Asia and Africa inspired motifs would add colour and make the outfit look classy and elegant and yet make a statement of unusual style. Since she is known for her penchant for the unusual hip look would suit her well. Wendell Rodricks (Goa): Barack Obama is fit and fine. He dresses up quite well too and frankly needs no help.